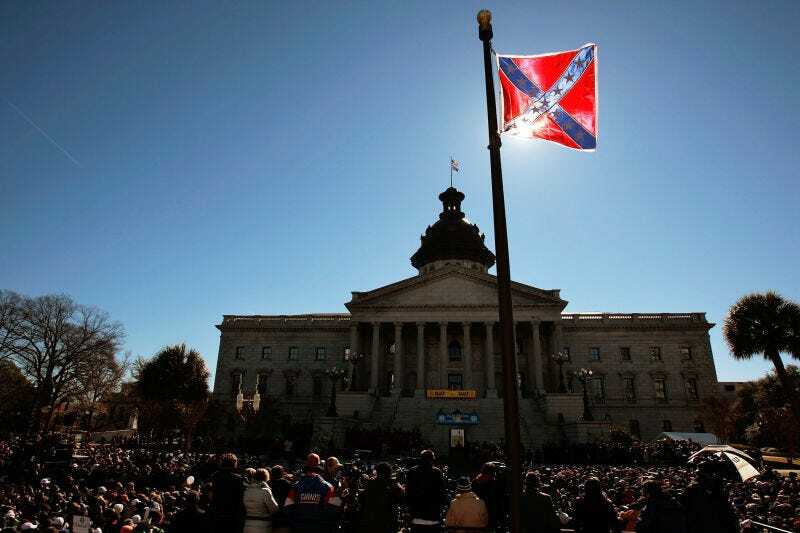 Should Confederate Symbols Be Banned in the US? Symbols of the Confederacy have been the subject of two very different events over the last few days. In Charlottesville, Va., on Saturday, white supremacists gathered to protest the removal of a Confederate statue from a public park, and their “protest” turned into a bloody riot, with one woman being killed and countless others being attacked and/or injured in the ensuing violence. White Supremacists Pop Off in Va. and Police Don’t Seem to Give a Damn. Why Is That? In Durham, N.C., on Monday, demonstrators gathered, arguably more peacefully, to denounce white supremacy and call for its end. They punctuated their statement by toppling a Confederate monument that stood in front of a downtown courthouse. Symbols of the Confederacy, including the Confederate flag, have been a hot topic of debate recently as many have sought to have them removed from municipal buildings and public spaces. The racist ideologies behind them still pervade and control American society today, and the very existence of the flags and statues is a slap in the face to all the progress America claims to have made where race is concerned. On Monday, Black Lives Matter Chicago took to Twitter and called for all Confederate symbols to be made illegal, much like the Germans banned all Nazi symbols after World War II. In reply to the group’s tweet, many countered with the argument that making those symbols illegal would be considered a violation of the First Amendment. The counterargument to that would immediately be that there are no First Amendment protections for hate speech, but the Supreme Court recently ruled that there is no exception to First Amendment protections for hate speech; free speech is indeed free speech, even if we are expressing our hate for something. Constitutional law is tricky; it’s old and antiquated and was written during a time when the laws were only meant to protect rich white men. Sadly, not much has changed in the way the law works now. The bottom line is that Confederate symbols are not free speech; they are monuments erected to pay tribute to an ugly time in our history, a time that was not inclusive and a time when black people in particular did not enjoy a great deal of freedom in this country. Why do we need to memorialize that? People have made the argument that these things represent history and they teach us lessons. My response to that: The lessons of history are happening right now, and that is what you should be learning from. All you “alt-right” people with your fake “Christian” values—don’t you realize that fighting for these symbols to stick around is in and of itself a hateful form of idolatry? Doesn’t your good book preach against that? I would argue that Confederate symbols, including the flag and all the monuments erected in memory of Confederate leaders, are not a form of free speech and do not qualify for First Amendment protection. They are symbols of hate, they are used as symbols of hate and they have no place in this country anymore. We cannot move forward and build a greater “union” until we have reconciled and dealt with our ugly past. Get rid of all Confederate symbols. We will be better for it.